Bone Meal is dropped by most undead creatures. 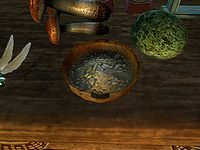 Specifically, it is always dropped by dragon priests, and can possibly be dropped by draugr, skeletons, and wrathmenDG. The three dead skeletons found during the quest Unbound always carry bone meal. The burned corpses found at the Western Watchtower in the quest Dragon Rising always carry bone meal. Bone meal is always dropped by dragon priests, including all of the named dragon priests who carry masks. Nearly all other types of undead have a 25% chance of dropping bone meal, with the exception of ghosts (who drop ectoplasm). This includes all varieties of draugr, skeleton, corrupted shade and wrathmenDG, as well as numerous named undead creatures and already-dead versions of the creatures. This page was last modified on 9 April 2018, at 03:31.